The 55+ objectors* to the Alma Club Development proposal joined together and mounted an extremely effective 4 day campaign (between the publishing of the Officers Report and the Council Meeting). Their campaign turned what was stated to be “close call” into a unanimous decision by Councillors (2nd July 2013 Council Meeting Minutes – Item 9.1) to reject both the Officers Report recommending approval (with relatively minor modifications) and the development proposal itself. This should become an example for the whole community as it shows that a combined and concerted effort by residents can have an impact. Unfortunately, Council’s failure to comply with the statutory 60 day notification period made the developer eligible (on 17th June) to lodge at VCAT Appeal prior to the Council Meeting and thus rendered Council’s decision moot. 1. 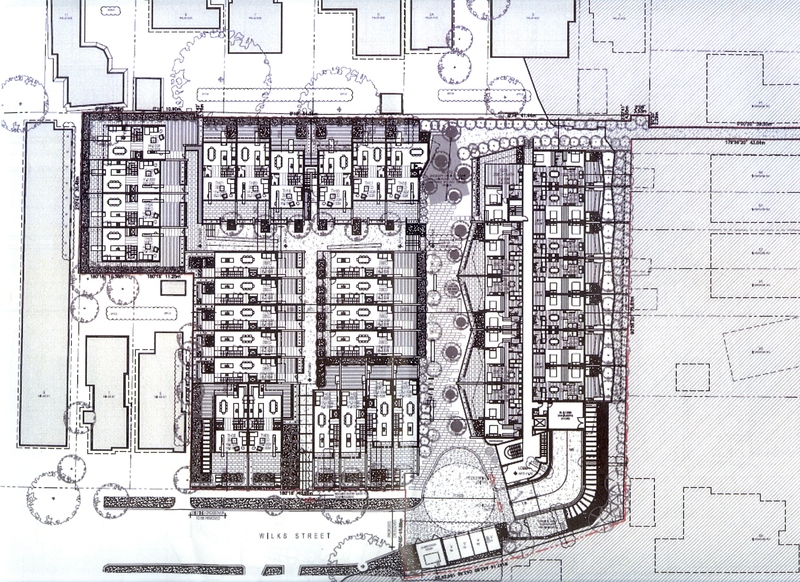 The development is inconsistent with the intent and objectives of Clause 11 Settlement, Clause 15 Built Environment and Heritage and Clause 16 Housing of the Glen Eira Planning Scheme as it fails to provide an appropriate built form response to the existing and preferred neighbourhood character.  The scale and intensity of the development is inconsistent with the preferred character.  The mass and bulk of the development will have an unreasonable impact on the streetscape.  The development will impose unreasonable visual bulk impacts on adjoining properties.  There are inadequate landscaping opportunities throughout the site due to the excessive basement footprint and inadequate ‘on structure’ landscaping.  The provision of secluded private open space is inadequate.  Clause 55.02-1 (Neighbourhood Character) The scale, bulk and intensity of the development is inconsistent with the prevailing and preferred character.  Clause 55.02-2 (Residential Policy) The development is inconsistent with Clause 22.08 Minimal Change Area Policy. Clause 55.03-5 (Energy Efficiency) Dwellings within the apartment building will have a poor level of energy efficiency due to poor orientation and access to daylight.  Clause 55.03-8 (Landscaping) The extent of the basement restricts reasonable in ground planting opportunities in the southern part of the site and fails to make adequate provision for ‘on structure’ planting.  Clause 55.04-6 (Overlooking) There are unreasonable opportunities to overlook the secluded private open space of adjoining properties.  Clause 55.05-4 (Private Open Space) The size and dimension of a number of private open space areas for townhouses and apartments is inadequate and provides a poor level of amenity to future users.  Clause 55.05-5 (Solar Access to Open Space) Solar access to the private open space of a number of dwellings is inadequate, resulting in poor internal amenity. 4. The development fails to satisfy the residential visitor car parking requirement of Clause 52.06 of the Glen Eira Planning Scheme and will have an unreasonable reliance on on-street parking in the area. Please note the above listing is largely in line with GERA’s earlier assessment of the Alma Club development proposal. While GERA welcomes Council’s decision (albeit moot) it raises a significant question on the role of the Planning Department and Planning Officers. The Planning Department and it’s Officers are required to assess planning permits against the policies and standards included in the Glen Eira Planning Scheme. Where a planning permit application is deemed to be non-compliant, Officers may negotiate with the developer to ensure compliance, however, the result of such negotiations should not be Council attaching conditions to a permit that “reduces” or “tinkers” with some aspects of non-compliance. Minimizing a breach does not constitute ensuring compliance with Planning Scheme, sets a precedence for future waiving or ignoring policy and results in a loss of amenity for existing and future residents. Slightly improving the compromised internal amenity (ie. access to natural light) of the lower level north-side apartments (which face an excavated wall) by increasing overhead balcony set backs. Increasing the number of visitors parking spaces from the proposed 4 to 10 – 30% less than the required 15. 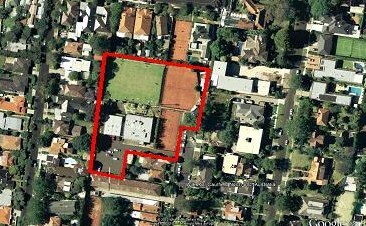 Given that Councillor’s and the Planning Department evaluated the development proposal against the Glen Eira Planning Scheme and arrived at very different conclusions we therefore re-iterate the above question on how the Planning Department and Officers views its/their role and how effectively it ensures compliance with the Planning Scheme. Under the Law, Councils had 60 days, regardless of the complexity or size (major vs. minor) of a proposal, to make a decision on the proposal. that, as is common practice, proposed development discussions occurred prior to planning permit lodgement (ie. prior to the commencement of the 60 day period – which started ticking when the planning permit was formally lodged on 19th March, 2013). Given the magnitude of the proposal it is reasonable to assume that the discussions were more extensive and at a higher level than is customary. Both the detailed reports, prepared by the developers expert witnesses, (“Town Planning and Urban Context Report” and “Traffic Impact Assessment” ) submitted with the permit application confirm pre-application meetings and discussions with Council Officers. The proposal submitted wasn’t minor or simple and involved a number of referrals to various departments which caused a delay. GERA Comments : It should be noted that the Officer’s Report Appendix makes the following statement “The application has been referred to various departments and individuals within Council for advice on particular issues as well as externally to the Director of Public Transport”. Since only one of the referrals related to a third party (a routine query to the Director of Public Transport re the development’s potential impact on public transport services – “no objection”), all other referrals were internal and therefore within the management of Council’s Planning Department. both the complexity of the project and the referral steps, applicable to all development applications, were well known. Residents are legitimately asking why didn’t Council’s Planning Department, prioritize allocated resources and referral processes to ensure compliance? Although not a legal requirement, Glen Eira Council uniquely chooses to hold planning conferences to better provide residents with an opportunity to understand the application and express their views. Planning conferences add a time element into the decision making process. GERA Comment: Leaving aside Mr. Akehurst’s comments on “Glen Eira’s “unique” planning permit consultative processes vs. that of other Councils (it will the subject of subsequent posting), again serious questions arise from Council’s failure to comply with the 60 day decision requirement. It is worth noting that the permit application was lodged on 19/3/2013, permit advertising commenced 1.5 months later on 1st May with an objection closing date of 14/5 /2013, the resulting Planning Conference was held on 5/6/2013 and the Council decision was scheduled for 2/7/2013. Inserting the date (17/6/201 – some 3 months or 90 days after application lodgement) the developer became eligible to lodge a failure to comply VCAT appeal into this time frame re-affirms the need to seriously question Council’s management of the assessment and decision making processes. Presumably, the developer anticipated that the planning permit application would result in a VCAT appeal and therefore decided to jump the VCAT queue by lodging a failure appeal prior to Council’s formalising it’s opinion … from Council’s and the residents’ point of view the failure appeal was good news it deferred the need for Council to formalise it’s view until it’s presented to VCAT (mediation in mid-August, final hearing end September). GERA Comment: Such comments not only serve to re-iterate all above comments about the Planning Department’s management of this permit application (ie. failure to comply and still being unable to formalize a view, a view that should be in accordance with their own well known planning scheme) but also contradict Council’s previous criticisms of VCAT (i.e. VCAT is an unknown and frequently goes against Council decisions or it is better for Council to approve this development to avoid the developer taking it to VCAT which may result in an even worse outcome for residents). Many residents (both GERA members and non-members) have expressed the opinion that, with regards the Alma Club development proposal, Council’s failure to comply with the 60 day requirement indicates the adoption of a “politically preferred” option i.e. let VCAT decide (presumably in favour of the development) this contentious issue and “take the blame”. GERA is not supportive of this opinion – in the Council Meeting discussions, all Councillors and in particular Mayor Hyams, commented that Council would unreservedly support the residents in their VCAT objections to this proposal. Rather than speculate on Council motives, GERA prefers to review future Council and Councillor support of GERAID at the VCAT mediation and hearing – needless to say “the proof is in the pudding”. Council is no longer the adjudicating authority and hence Council’s role is now that of determining the conditions (ie. modifications) required to be applied to the permit application to make it compliant with the Planning Scheme and therefore acceptable to Council. As per VCAT’s practice notes (ie. not a legally enforceable obligation) Council should notify the residents of these conditions with 7 days of the VCAT hearing. While practice notes provide guidelines re the minimum requirements for keeping objectors informed, no upper limitations are placed on information provided to residents. Since no limitations are placed on Council and the Developer continuing to negotiate “acceptable” conditions, it is important that residents maintain Council/Councillor contact to ensure they have sufficient time to fully gauge the implications of the each condition and avoid receiving all at once with limited time to review. Such implications should be noted by GERAID members and objectors to the development. All objectors should be actively requesting all Councillors to be aware of decisions made, or conditions agreed to, by Planning Officers and accordingly inform the resident objectors. Councillor involvement in the process should not stop after a formal decision has been made – Councillors should be monitoring subsequent events and appropriately informing residents. This is the proof that should be in the pudding. GERA continues to support the objectors and wishes them well in their “tone it down” quest – both for themselves and future development residents. This posting, which focuses on the Alma Club Development’s Traffic and Parking analysis, is a continuation from our previous posting entitled “Alma Club Development – Council Decision (Part 1)”. As previously mentioned Cr. M. Lipshutz was the only Councillor who mentioned the Traffic and Parking impacts of the development. Cr. Lipshutz commented that every development will bring about increased traffic and on street parking demand and therefore these should not be considered issues. While residents accept that the Alma Club site will be developed and that increased traffic and parking will result, the size of the proposed development combined with the site’s the limited vehicular access, will result in significant traffic congestion and on street parking demand which will have a major adverse impact on residential amenity and safety. Unfortunately, Cr. Lipshutz’s comment and the “Car Parking and Traffic” analysis included in the Officer’s Report, does little to assure residents that their concerns are being given due consideration and/or will be addressed in the future. “In relation to traffic, the expected traffic generation can be considered in the context of the traffic generated by the Alma Club (when it was operational). Therefore,whilst there will be a noticeable increase in traffic during residential peak times (ie weekday mornings), there will also likely be less traffic at other times when the Alma Club would have generated traffic, such as weekends. Furthermore, Council’s Transport Planning Department is satisfied Wilks Street can accommodate the traffic generated by the development. On balance it is considered an increase in traffic movements within Wilks Street as a result of this development is not unreasonable”. “In relation to traffic, the expected traffic generation can be considered in the context of the traffic generated by the Alma Club (when it was operational). Therefore, whilst there will be a noticeable increase in traffic during residential peak times (ie weekday mornings), there will also likely be less traffic at other times when the Alma Club would have generated traffic, such as weekends”. Please note the above turning estimates are per hour vs. the 2 hour period for the current actual vehicle turns. • Based on peak hour traffic turn counts undertaken by the developer’s consultants and assuming a peak to daily ration of 10% the consultant extrapolates that Wilks Street carries approximately 250 vehicles per day. Unfortunately neither the residents mathematical prowess nor their long term experience support the 250 continuous daily vehicle flow even when the Alma Club was fully “operational”. o In its “heyday” the Alma Club had approximately 500 members (predominantly locals) with most locals preferring to walk rather than drive. o Bowls (1 artificial lawn area) although a competitive team sport (team numbers are less than a footy team), team members favour carpooling and the sport does not generate large numbers of spectators. As mentioned in our earlier post, residents report the only time traffic volumes in Wilks Street resulted in vehicle banking was on the opening and closing days of the lawn bowls season. Since these were timed events (arrival and departure) this vehicle banking was not a significant disruption. o The relatively small function centre was primarily used for largish family gatherings (50th Anniversary, 21st Birthday, Small Business functions etc.) and again did not serve large numbers. It should be noted that the 420 vpd Proposed Development Weekday Flow will comprise many heavy vehicle movements (earthmoving equipment and trucks, cranes, building material deliveries). the rat run conditions in Norwood Road arising from residents of the Dandenong Road (south side) multi-unit developments using Norwood Road to access their property. it is understandable that residents of Wilks Streets and the surrounding streets, are concerned that their issues re development traffic are not being given appropriate consideration and that Council, if VCAT approves the development, will endeavour to ensure the adverse impact from traffic is minimised. o Saturday, 8th December, 2012 at 12.00 noon and 8.00 pm. This survey indicates a total of 50 on street parking vacancies identified with 22 vacancies being in Wilks Street – a dead-end street. No mention is made that 28 vacancies identified in Alma and Norwood Roads reflects the high demand for on street parking currently experienced in these surrounding streets. Additionally, the consultant’s report mentions that “one additional on-street car parking space is to be gained through the removal of the existing crossover to the Alma Bowls car park”. However, no mention is made of the 4 on street car parking spaces, currently located at the end of Wilks Street, which will be removed and replaced within the site as visitors car parking. As with the above outline of the traffic issues opponents to the Alma Club Development, raise the following issues regarding on street car parking. o not taken into account planning permits issued but yet to be completed or granted extensions, which will create additional parking demand in an already high demand area. o Accepted a provision for 25 bicycle parking spaces that are to be included in the basement (17 residential spaces) and on the ground level within the “linear park” (8 visitor spaces) yet these spaces are not included on the development plans distributed at the Planning Conference. o yet to implement the residential parking permit scheme for local streets impacted by the development during construction and post completion. o Accepted empirical evidence from the developer’s consultant with regards traffic and parking but has yet to acknowledge the empirical evidence offered by the residents. With regards to on site car parking, residents advise that the 52 on-site spaces (even on the busiest days (opening and closing of the bowls season) was adequate for the Club’s needs. • While Council’s requirement for the developer to notify potential development residents, and post appropriate signage on the property, regarding the developments exclusion from the residential parking permit scheme is worthwhile, it should be noted that it is a requirement that is unenforceable by Council and has been ruled ruled as beyond the scope of planning law/rules. As with the Traffic issues outlined above, objectors to the development hope that prior to the VCAT hearing (end September, 2013) Council, the Developer and Residents continue to discuss the issues raised by the residents and that a consensus comprise can be reached. With the impending release of Council’s Planning Departments Report on the Alma Club Development proposal and Council’s formal discussion and decision on the proposal scheduled for next Tuesday (2/7) it is worthwhile updating readers on the development proposal. 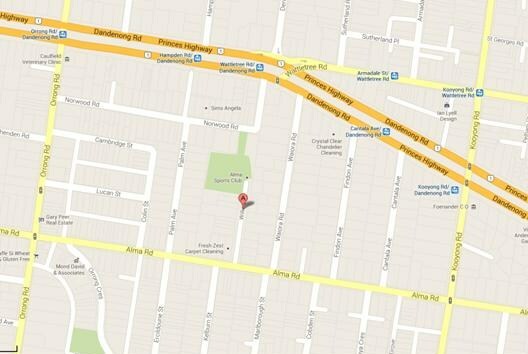 • Location – the property’s address is 1 Wilks Street, Caulfield North – Wilks Street being a short (approx. 350 metres), narrow, dead end street off Alma Road (between Kooyong and Orrong Roads). Located in a minimal change residential area, the irregular shaped property comprises 7,100 sqm with a 40 metre frontage on Wilks Street and an approx. 1 metre pedestrian walkway frontage on Norwood Road. • Site History – In the early 1800’s the site, featuring sand dunes with numerous springs, clear streams and grazing areas, was the first night stop for travelers to Gippsland. However, during the 1850’s gold rush and land boom, the building industry’s demand for “clean sand” soon saw the site mined for sand and eventually the denuded and degenerated site was abandoned and later became a rubbish tip. In the early 1900’s, growth in surrounding areas saw the site purchased, the sand pits filled and leveled to become a sports club, comprising a bowling green and tennis courts. Since that time the Alma Club changed from being individually owned to a members owned club and various facilities were upgraded and expanded to include a 2 storey building (comprising squash courts, clubs rooms, a function centre which includes a restaurant, bar and small cabaret venue) and off street parking. o The official history of the Alma Club records that club building works usually result in the history of the sand dunes and springs manifesting itself. Even in severe droughts, springs have resurfaced and required sand bagging to direct flooding into in Wilks Street and Alma Road. o The property’s irregular shape and limited street frontages probably arise from subdivision occurring when the property was being operated as a sand mine or a rubbish tip. • Alma Club Sale – Unfortunately, as reported in the 7/8/2012 Leader, dwindling membership, financial decisions and decline in grass roots sports meant the club was no longer viable. With land valued at $8m and existing sporting facilities, the Club approached Council with a $3m sale/lease back proposal in early 2012. Although acquisition of the Club is in line with Glen Eira Council’s open space and community facilities strategies/policies and a bargain basement price being proposed, Council rejected the proposal. Council did not discuss the potential acquisition at an open Council Meeting nor did Council enter into any discussions/negotiations with the club. (Refer previous GERA postings 9/8/2012 and 28/8/2012.) On August 29, the site was sold at auction for $7.94m (less a $300K cost of relocating the telecommunications tower) to a developer and the expected $100m development (predicted in the Age, 28th July, 2012) is firmly in the pipeline. The planning application currently being reported and decided upon is for 75 dwellings comprising 50 dwellings in a 4 storey apartment building and 25 townhouse style dwellings of 2-3 storeys (17 two storeys and 8 3 stories) above a basement car park and a waiver in visitors car parking requirements. • The presented plans are conceptual in nature and lack the level of detail (heights, dimensions, roof pitches etc) of plans which usually accompany planning permit applications. Concept Plans are a first stage in the planning process and invariably as more detail is added changes are required to be made. Generally, the rule of thumb accepted by the industry is an average change of 30% between concept and detailed plans. Once a concept plan has been approved by Council, subsequent changes to detailed plans need not be re-submitted for community consultation if those changes are “generally” in line with the concept plan. Therefore, the 50+ residents objecting to the proposal are understandably concerned at the lack of detail provided and the deficiencies they see in the concept plans (even though the plans take “into account the advice provided by Council officers during pre-application meetings”). • Clause 21.02 Municipal Strategic Statement recognises “the need to direct medium density residential development to locations where it will have the least impact on residential character”. The term “medium density” is not defined (nor has it been defined by any Government Department or Local Authority) and is therefore open to interpretation. 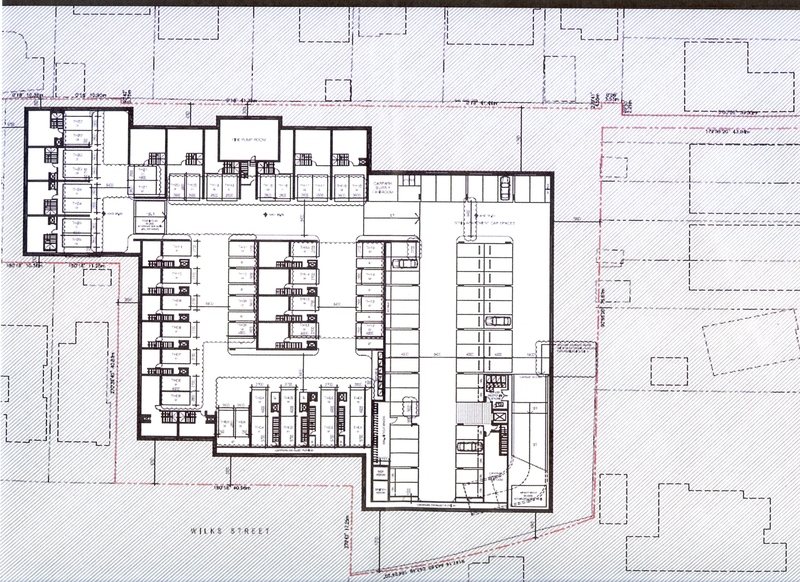 Below is the concept plan’s ground floor layout which is described by the developer’s consultant as medium density. Given the intensive, boundary to boundary, scale of the development use of the term “medium density” is questionable. The land locked site’s severely restricted access (only one vehicular access point and 2 pedestrian access points) raises more questions about the sites suitability for such an intensive development regardless of which density level term is applied. Although the Context Report mentions, several times, the “potential to establish a safe though site link between the termination of Wilks Street and Norwood Avenue”. However, no further details (who, when, how, challenges in addressing grade changes) are provided and as such this comment should not be a factored into Council’s current decision making process. The development’s concept plan acknowledges that the site is in a minimal change area and within the Caulfield North area of the Neighbourhood Character Areas Plan in the Minimal Change Area Policy Framework Plan. The Caulfield North Area being considered to have a Victorian/Edwardian Garden Suburban character with modern overbuilding. • Provision of On-Site Car Parking – the Context Report states that basement car park is to be included “to provide a landscape dominated site plan, and provide a rate of parking within the basement commensurate to the dwelling yield”. No details are provided of the basement depths and their potential impact on the natural springs within the site or their potential limitations on landscaping plantings. Car park vehicle access will be from Wilks Street and various access points within the development will enable residents to access their vehicles. At ground level all movements within the development will be pedestrian only.  the surrounding streets where on street parking demand exceds supply (caused by waivered parking requirements for Dandenong Road developments and commuter parking). o Individuals make various choices as to where they live, work and play, how they travel between these various locations and how many vehicles they own. It is the responsibility of the development or facility that attracts people to provide on-site car parking, where a development or facillity does not provide car parking in accordance with State Government minimal requirements it should not become the responsibility of nearby residents to provide that parking. While the concept of underground parking and pedestrian only above ground zones are appealing, a major concern of residents is the development’s provision of adequate access for emergency vehicles (fire brigade, police and ambulance) and vehicles delivering goods (moving in/out, furniture/white goods) and services (tradespeople). • Traffic – As previously mentioned Wilks Street is a dead end street, approximately 350 metres long, located off Alma Road (between Orrong and Kooyong Roads). These three main roads experience significant peak hour congestion, heavy traffic movements throughout weekdays and steady traffic volumes in evenings and on weekends. Traffic volumes in Wilks Street, arising from the Alma Club activities were significant on two days per year (opening and closing of the lawn bowls seasons) for a limited time (arrival and departure of a timed event). At other times the Alma Club generated minor traffic movements as its sporting facilities (tennis and squash) and function centre did not attract large numbers or a continuous traffic flow. o in Alma Road as vehicles wait to right turn into Wilks Street. However, the Context Report states “that the additional traffic generated by the proposed development could not be expected to compromise the safety or function of the surrounding road network”. The Context Report mentions, several times, the “potential to establish a safe though site link between the termination of Wilks Street and Norwood Avenue”. As previously stated, in the absence of further details, this comment should not be a factored into Council’s current decision making process. 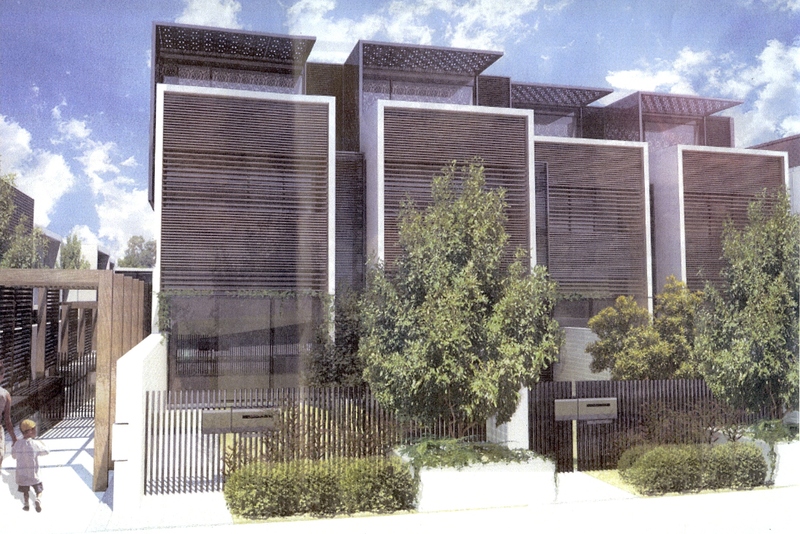 o Townhouses – “court yard sizes for the townhouses ranging between 41.5 sqm and 136 sqm with the average being 61.96 sqm. The Schedule to the Residential 1 Zone recommends private open space provision for dwellings in the Minimal Change Area of 60 sqm and therefore the average provision is considered acceptable”. o Apartments – “with regards the apartments, it is unreasonable to assess this format of development against the Schedule to the Residential 1 Zone, instead the terrace sizes range in size between 6.5 sqm and 58.5 sqm, with an average size of 20sqm”. The recommended private open space is 20sqm. • Internal Amenity – it is difficult to reconcile the Context Report’s statement that the development is a well designed, high quality development with the Report’s comment that light wells have been included to provide daylight (and presumably ventilation) into some of the apartments bedrooms as these are internal to the dwelling. • Overlooking vs Passive Surveillance – the Context Report’s statement that potential overlooking has been “managed through setbacks and provision of appropriate screening and/or fenestration design” is difficult to reconcile with the Report’s frequent references to the increased security the development offers adjoining residences via the provision of “increased passive surveillance opportunities”. Please note, not all issues raised by residents are included above (eg. location of the telecommunications tower). No doubt additional issues will be raised during the application approval/rejection process. These issues will be highlighted in subsequent postings. The Alma Sports Club was just sold at auction for $7.94m. Glen Eira has just lost a unique opportunity to acquire significant open space. Following on from GERA’s previous posting re the sale and probable $100m redevelopment of the Alma Sports Club, residents should note that the potential sale/leaseback agreement between Council and the Alma Sports Club (a land locked site of 7100+ square metres, valued at $8m for $3m) was again not openly discussed at the last Council Meeting (14/8/2012). Although the potential Alma Sports Club sale/leaseback was mentioned in response to a public question raised by a resident, the public question (presented below – (Council Meeting Minutes, 14th August, 2012 – Section 11.4) did not engender any discussion – it comprised a formal reading of the question and answer. Cr. Penhalluriack dissented from the response. “The Alma club proposed that Council buy, and then leaseback, the land to the club so that the club would continue to operate as before. Council did not accede to that proposition. Council spends far more each year on improvements to public open space than it receives in open space contributions. Council’s 2012-13 Budget and ten year Strategic Resource Plan already commit Council to spend the open space contributions expected to be received. A priority is to convert the former Glenhuntly reservoir to public open space. The reservoir is on two main roads and a tram line and is very accessible to the community. Council understands that negotiations are underway for the proceeds from sale of the site to be used to improve community recreation facilities in Glen Eira. not entering into formal discussions of the potential sale/leaseback agreement. Any agreement would involve a myriad of details, proposals and counter proposals yet none of this has occurred. Council’s seemingly dismissive attitude appears to be summed up in the February, 2012, response to a public question which was attached, without any preamble, to the last page of the Council Meeting Minutes, 20th March, 2012. “There are dozens of clubs within Glen Eira. There is no prospect of Council using ratepayers’ funds simply to provide financial support to the operation of any private club”. 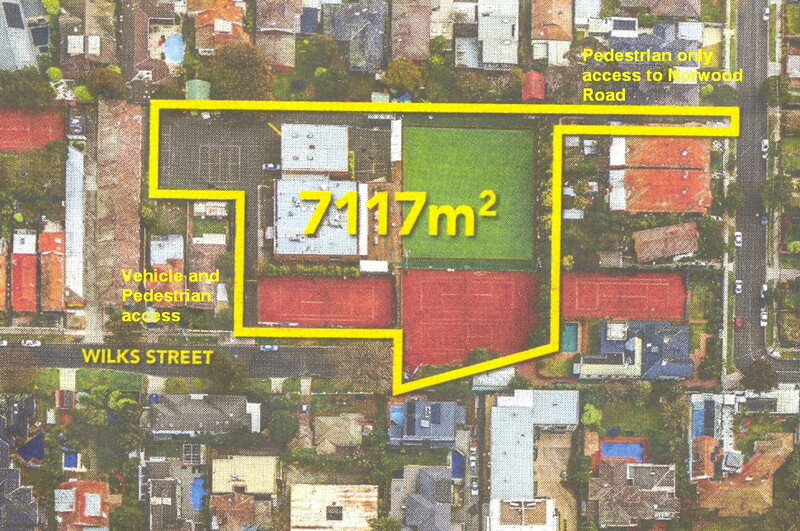 As a result, Council is showing a lack of will and vision, a continued unwillingness to actively address the well documented and long standing residents’ concerns re a need to increase the amount of open space – hence the end result will be that a site with enormous potential for providing passive open space will be lost forever. As surmised in our previous posting on this issue, we repeat that GERA believes that Council (Administration and Councillors) have a lot to answer for the handling of the Alma Club issue. Discussions/negotiations have never gone beyond the initial proposal, yet this proposal is not dissimilar to various other proposals where private club facilities have been built on public land. GERA believes Council has not acted impartially, responsibly or prudently by not formally discussing the sale/leaseback agreement and re-iterates that in doing so Council has shown a lack of vision and a failure to invest in the future of Glen Eira. Private sporting/social club facilities on public land is an accepted concept – it represents a subsidy to the club which enables facilities, that benefit the community, to be built which might otherwise not be built. Providing such “subsidies” is one of the essential roles of government. Usually, the public land exists prior to the building of the facilities (eg. the most recent example being the 2008 Maccabi Victoria Sports Foundation building of the Leon Haskins Tennis Centre in Bignell Road, Bentleigh East), however, in the Alma Sports Club instance the process differs. The facilities have been built on private land that, under the proposed sale/leaseback agreement, would later become public land. Regardless of the process, the end result is the same – a fact which Council has failed to recognise or take into consideration in it’s decision to “not accede” to, or even discuss, the proposal. The Open Space Contribution Levy, is a State Government legislated levy, payable (in the form of land or dollars) to Council, by developers when a site is subdivided. It is intended to provide Councils with funding for the acquisition of parkland, however, unlike other Councils, Glen Eira Council does not segregate these funds for the specific purpose of the acquisition of new parkland. Glen Eira’s interpretation of the legislation is such that funds raised from the levy may be used to maintain existing parkland. As a result, when rare opportunities arise to acquire open space, such as the unique Alma Sports Club opportunity, this Council does not have the funding readily available to take advantage of the opportunity and can, with questionable validity, claim it does not have the funds. Council’s 2010-2011 Annual Accounts states that in 2010 the Open Space Levy revenue was $1.630m and in 2011 it was $1.664m. For the past 15 years Glen Eira residents have repeatedly and vocally expressed a need for more open space yet Council persistently uses the Open Space Contribution Levy for general parkland maintenance rather than the acquisition of future parkland. Residents are now asking why this is so. Unfortunately Council’s performance on the Glen Huntly Reservoir (also known as the Booran Road Reservoir) does not support a “priority” status being given to this site. As mentioned in our 15th June, 2012, posting on the Booran Road Reservoir, in 2006/8 Council knew that the site would revert to Council (the site was officially reverted to Council in 2010). Despite two public consultations (March, 2008 and June, 2012), Council is yet to develop any substantive plans for the site. Council’s 2012 Strategic Resources Plan provides for conversion work on the reservoir to commence in 2016/7 and estimated a completion time of 2 years. Given the well documented and long standing open space issues within Glen Eira, the fact that it has taken/will take 13 years (from unofficial knowledge of the site reversion in 2006 to actual park completion in 2018/9) raises a question about Council’s definition of “priority”. Council’s well publicised statements re GESAC are that it was under budget (under budget construction costs being further offset by liquidated damages) and financially successful – GESAC was not only self-funding but would also generate a profit. Now, in what GERA predicts will be first of many instances, the GESAC loan commitments are a major reason Council is unable to take advantage of this unique opportunity to valuable open space. Of the reported $7.1m shortfall, $3m is already budgeted for and Council has 15 years to budget for the remaining $4.1m (Glen Eira Leader article – Superannuation Debt). As mentioned in our previous posting and confirmed by the above answer to the public question, discussions with the Alma Sport Club, have been minimal. Council has not reviewed or considered the proposal in any detail or reviewed the proposal to the extent that a counter proposal could be made. The advertisements re the sale indicate that generous interest free vendor terms are available – a consideration that Council has failed to take into account. Not only would be the club owned land be available to Council at a heavily discounted price, the lease back agreement would provide an income for Council. The Alma Sports Club constitution clauses related to the dissolution of the Club precludes individual members benefitting from the sale of club assets. In the event of dissolution, any profit made on the disposal of club assets must be returned to the community via distribution to a similar organisation/s or Council. Hence, as mentioned in the above response, “Council understands that negotiations are underway for the proceeds from sale of the site to be used to improve community recreation facilities in Glen Eira”. Given Glen Eira’s aversion to pocket parks (most, along with small community centres, having been sold to developers pre 2004), Council’s statement that it “would propose to take the open space contribution in the form of land to be used to provide a park for the local community” is inconsistent with Council’s track record. 5% of the land value is the maximum open space contribution that can be levied on developments – simplistically, that means that Council would gain approximately 356 sqm of the site as parkland. The Community/Council Plan recognises the importance of open space and states that Council “will actively seek new opportunities to increase and optimise open space” because it also recognises that Glen Eira has the least per capita open space in metro Melbourne (a per capita ratio that is further declining as development continues). Reading this it would be reasonable to assume that when Council is presented with a rare opportunity to acquire the heavily discounted 7100 square metre Alma Sports Club site for $3m (located in a densely populated minimal change area), Council would at least seriously consider the opportunity and allow residents to express their wishes. Alas not so. When presented with this unique opportunity early this year, Council has rejected the offer without any meaningful dialogue with the club and has yet to discuss the offer in an open Council Meeting. The end result of Council’s rejection appeared in the The Age, 28th July, 2012 – the site is now “expected to sell for about $8 million and, following a rezoning, make way for a $100-million plus village with commercial and residential components, according to sources”. GERA believes this offer (an $8m site for $3m) was worthy consideration and open discussion at a Council Meeting. By rejecting the offer, Council has shown a lack of vision and a failure to invest in the future of Glen Eira. The 85 year old Alma Sports Club, located in the narrow, dead end Wilks Street, Caulfield North, occupies a 7100 square metre site. The site (in a residential area and only accessible from Wilks Street) features squash courts, 3 entous cas tennis courts, bowling green, car park and a generous club house with recently renovated facilities (restaurant, function rooms, bar and a cabaret venue). In recent years, the not for profit, community focussed club has experienced financial difficulties. Wanting to preserve the amenity of the area, the Alma Sports Club approached Council to informally discuss a possible sale of the land/lease back agreement – the basic concept proposed by the club was for Council to buy the site for the cost of the mortgage ($3m) and allow the club to continue operating by a lease back agreement. Unfortunately, this proposal never progressed beyond the informal stage as Council (i.e. the Administration) categorically rejected the offer. No discussion/decision occurred in an ordinary Council Meeting. The Record of Councillor Assembly for 31st January, 2012 (included in 20th March Council Meeting Minutes Section 8bi – refer below link) is, as usual, uninformative. Residents should be aware that Councillor Assemblies are in camera briefing sessions between the Council and the Administrations – by law decisions cannot be made at Assemblies, they can only be made at minuted Council Meetings. At the Council Meeting of 28th February, 2012, a public question was submitted by the Alma Sports Club, however, the question was read and answered at the meeting nor was it recorded as being taken on notice in the minutes of that meeting (as required by local law). The public question arose out of frustration at Council’s refusal to discuss the potential sale and leaseback agreement with the Alma Club. The question and response was later attached, without any preamble, to the last page of the Council Meeting Minutes, 20th March, 2012.
is expected to become “a $100-million plus village with commercial and residential components, according to sources”. The fact that this land is located within a minimal change area and has limited access (dead end, narrow street) will not preclude a major development. The minimal change area policy, which generally restricts development of a lot to two dwellings, also states that where the lot size is larger than average (without an accompanying definition of larger than average lot size) higher density development will be permitted. GERA accepts that at 7,100 square metres the site qualifies as “larger than average lot size” – in this pro-development Council the question is not if it will be permitted, it is how big will it be. GERA finds it deplorable that this issue has never been discussed at an open Council Meeting and that Councillors and the Administration, by refusing to discuss a sale/lease back agreement, have allowed a site with enormous potential for providing passive open space to be lost forever. In refusing to enter into any meaningful dialogue with the Alma Club re the potential sale/lease back agreement Council has again failed, despite it’s rhetoric, to increase Glen Eira’s open space. Additionally, in failing to discuss the opportunity in an open Council Meeting, Council’s claims of open, transparent, accountable governance are called into serious question. increasing the Open Space Contribution Levy, which is a levy payable to Council by developers when a site is subdivided and which is intended to provide Council with funding for the acquisition of parkland. The State Government determined maximum rate payable on this levy is 5% of the land value – as mentioned in an earlier GERA Open Space posting, Glen Eira open space levy rates vary across the municipality and rarely is the full 5% charged.